Facebook, Twitter, Friendster (remember this? ), WhatsApp, BlackBerry Messenger, and many others turned out to be a success making millions of people in every country intoxicated. Perhaps no one has been addicted to social media, especially the users of smartphones. They became closer with your friends or family who live very far away, and getting away with the closest, even when we sit down with the people we care at home, café or airport lounge. It seems like the information technology managed to make us as anti-social beings, so that we become less in real communication, maybe even cuddle up with a loved one. Well, I was moved by a video that I received from the WA group, where I became an active member. Maybe you also have to accept and watch this video. Hopefully you also touched when watching for the second time in this article. Let us see again together, with an expectation we will get back in touch with relatives, friends, even our neighbors to chat in real sense and laugh together, share stories, and even do fun things with them. I hope this video makes us realize "something very important" has been missing from our real lives. If you believe the purpose and the main purpose of this video, please share it with friends, neighbors, family and anyone you know. By doing so we will meet more often in the real meaning. You must know what you must do to be a real human beings. I hope this video can inspire us all to get to know kemabali what is the meaning of friendship, love, togetherness, caring, and wonderful things that are supposed to be able to do, even we can enjoy our lives. Perhaps you will soon discover the real meaning of happiness. If you believe, every decade there will be someone who was born to inspire a lot of people around, and even can affect millions of people nationally and globally. Indonesia also fortunate because it is blessed with Sukarno and Hatta who have fought and proclaimed the independence of Indonesia on August 17, 1945. Sukarno had become a magnet in Asia and Africa, so that inspired many nations in the region to independence from foreign occupation and colonialism. Now, in the digital and smartphones era, someone who could bring winds of change are also needed. After Sukarno, Indonesia has Jokowi and Ahok who have the vision to build a better Indonesia. 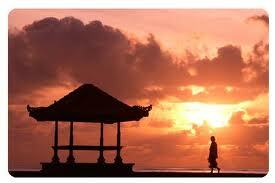 He came from Solo, a small town in Central Java. He started life as a businessman and export of furniture products to many countries. He was interested in politics and became mayor of Solo in the two periods. Not finished his second term, Jokowi asked by Megawati Sukarno Putri, chairman of the Democratic Party of Struggle (PDIP) to be nominated as Governor of Jakarta, Indonesia's capital. Joko Widodo or Jokowi also choose Tjahaja Basuki Purnama aka Ahok as deputy governor. They won office as governor. They do a lot of changes in this metropolitan city. 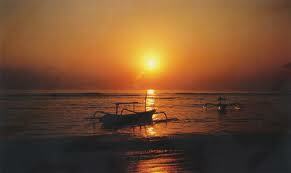 Towards 2014, Jokowi again requested by Megawati for become a candidate for president of Indonesia. Happen very tough competition with main rival General Prabowo from Gerindra. Eventough with a simple appearance, but with a very interesting campaign programs, Jokowi was elected as the new president of Indonesia in 2014. Meanwhile Ahok, the deputy governor of Jokowi, was finally inaugurated as Governor of Jakarta to replace Jokowi also sworn in as president. Ahok inauguration has been plagued by political opponents, but the people of Jakarta to reject any hindrance from the elites of the opposition party. People Jakarta has enjoyed a lot of fundamental changes that have been made by Jokowi along with Ahok. Ahok is also a descendant of Chinese immigrants. Ahok family is businessman in the island, and is highly respected by the surrounding community, so Ahok elected as regent of East Belitung, and eventually became a member of the House of Representatives in Jakarta. Subsequent career was as a deputy governor of Jakarta, and replace Jokowi as governor until today. Meanwhile Ahok, deputy governor of Jokowi, was finally inaugurated as Governor of Jakarta to replace Jokowi also sworn in as president. Ahok inauguration has been plagued by political opponents, but the people of Jakarta to reject any hindrance from the elites of the opposition party. People Jakarta has enjoyed a lot of fundamental changes that have been made by Jokowi along with Ahok. They believe that Ahok will be able to continue the vision and missions undertaken by Jokowi. 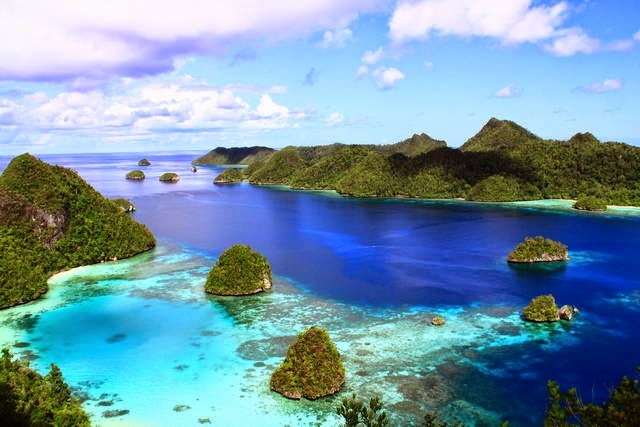 As Jokowi, Ahok also come from a small island in North Sumatra, Bangka Belitung. Basuki Purnama Tjahaja alias Ahok, is a political figure who is simple, outspoken, tough, and a little easily angered towards something goes wrong in the bureaucracy. He was also very firm to run the Jakarta government regulations. There are many problems and complexities in the previous decade can be resolved very firmly by Ahok. Certainly Ahok lot of resistance from the bureaucracy, political opponents, activists and civil society organizations who do not like the policy of Ahok, especially for curb certain areas in Jakarta were occupied illegally by society, even by thugs and officials who decades became patron thugs or preman. As well as Jokowi, Ahok was very exasperated with the corrupt behavior of bureaucrats, and businessmen who pay bribes to civil servants in local government. 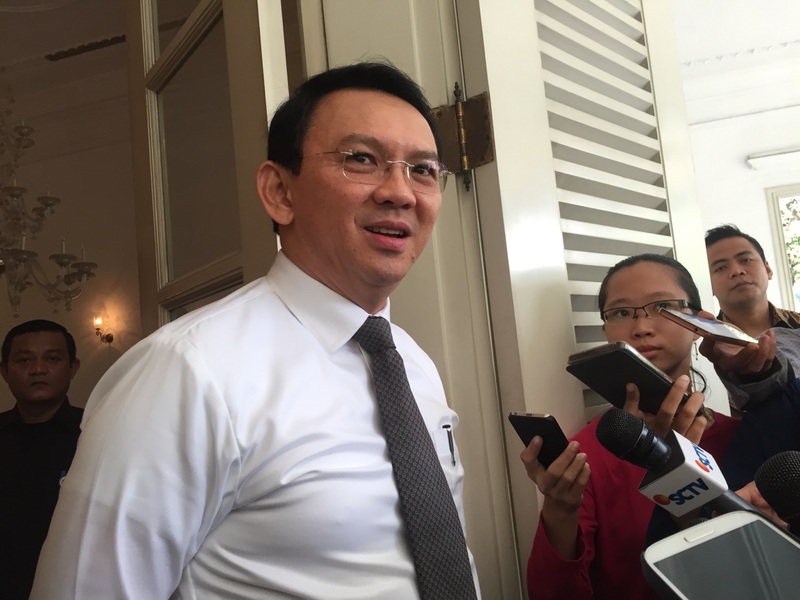 Ahok is very outspoken when commenting on irregularities in the administration. He firmly mutated officials or government employees who worked incompetence. If there is a proven accept bribes or corruption, then they fired faster than in the government in the previous five years. When Ahok evict squatters in a specific location around Jakarta, Ahok indeed act decisively. Ahok is certain to be much resistance from activists, artists, and even lawyers, and sometimes there is interference from human rights organizations. However, Ahok always had appropriate solutions. Ahok will provide flats belonging to the Jakarta government to the people who have been relocated. People are given three free months for occupy the flat and pay rent is very affordable after three months. They were also given a bed, refrigerator and other supporting facilities. There are many changes and order were successfully carried out by Ahok. Bureaucracy in Jakarta from the central to the mayor's office - districts and villages has now changed, and better serve the needs of the community more quickly than five years ago. Officials in Jakarta has not dared to take bribes or commit extortion. Ahok is understood that to be the governor with a background in the Chinese and Christian in Muslim majority such as Jakarta is not easy. However, Ahok never walk alone. Apparently, the majority of people in Jakarta loved Ahok because he is honest, assertive and anti-corruption, although there are certain political elite intend to drive Ahok that serve as a corruption suspect. Ahok considered to have been an inspiration for government that is transparent, accountable and maximizing digital technology for run the government, so it can detect early Ahok for find any irregularities in the bureaucracy. Ahok also dare to resign from Gerindra, and run for a second term in 2017. He ran as an independent candidate. Nonetheless, there are two smaller parties that support Ahok, namely Nasdem Party and Hanura. Ahok has accumulated more than 800 thousand citizens of Jakarta ID card, as a condition for an independent candidate. Volunteers such as “Teman Ahok”, are sure to be collected one million ID cards in the near future, and it exceeds the terms and conditions of the Election Commission (KPU). As someone who has successfully run the government in Jakarta, is very strange that the PDI-P did not participate to support Ahok the Jakarta governor election in 2017. With a unique Ahok, Jakarta will have a leader who can bring Jakarta for the better as a modern and prosperous city, not because the MRT, LRT or wider sidewalks, nor because managed to reduce the impact of flooding and traffic congestion, but as a true inspiration and a real example that has been shown by Ahok. If Megawati Sukarno Putri as chairman of the PDI-P has a great soul as a maker of kings, Megawati will certainly be able to convince the elite in the party her support Ahok as Governor of Jakarta at elections in 2017, the PDI-P will be a big advantage, where the party will win election to the Parliament, could even win the presidency in 2019. Do Megawati will release these opportunities. Perhaps the chairman of the PDI P will support Ahok officially in the last minute before the official nomination. We can only wait patiently. How about you? 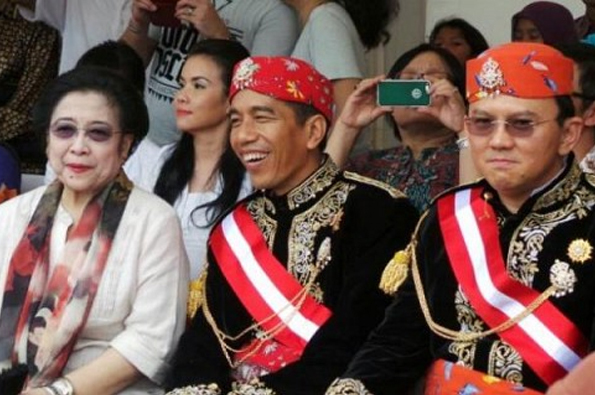 Are you also wonder and exasperated with Megawati style? However, Ahok is very confident, that as an independent candidate is also a way for elected governor for a second term in 2017. Towards the end of the year, we might ponder what we have done before, and what plans or our expectations for the coming year. Perhaps no regrets because we are single or multiple failures that have occurred in our lives. There seems to be an unsolved problem, as if without a solution. However, if the sun always rises in the east, although not always right on the eastern horizon, the morning sun is always punctual in every season. Time probably will always pass, and often we do not care. There are among us who may be hopeless, afraid to start something new, do not dare to change. Yes, almost everyone has experienced difficulties and challenges in life. And, every end of the year, ahead of the New Year's Eve we always have a moment to once again ponder about life, not only to regret the past, and we always have hope for a better future. If the above narrative that does not inspire you or me, then I want to share many wonderful sayings or quotes that can wake you from solitude and ready for future action to build a more beautiful, more successful. 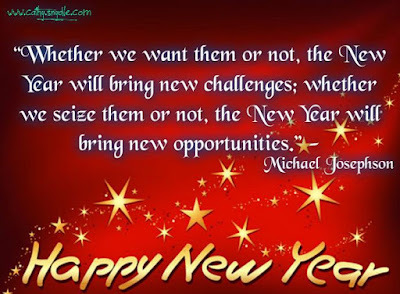 If you have a dream that has not been fully realized, with all the courage we have, coupled with all the hopes of remaining in our hearts, then we can make a small hope become a remarkable achievement in the coming year. I know, you will rise up to pursue our dreams and embrace happiness. I believe, you also believe that the expectations will turn into a reality, even far exceed your expectations. And I love this quotes. Do you agree that an old man is wiser than younger people? You definitely do not agree. There are few events in life and major events in the world, young people can do extraordinary things. Does this happen because they are wise? There are many wise words that suddenly just came out of someone, or we hear from the speeches of leaders, or because we get it from a book that tells the story of a simple life. There is also wisdom that is in the middle of communities. Wisdom it was able to respond to the challenges of time. So, to receive or seek answers about life does not always have to come from the great people. Look around us, in our hearts and in the eyes of our children who are still naive, perhaps you will find meaning in life that we've been looking for. 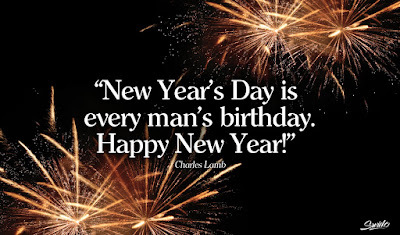 Are you planning anything special to celebrate New Year's Eve? There may be a sense of disappointment in the days, months and years that you've been through this year. Among you there is also a successful hit the target or your dreams. Happy or sad, has always been part of our lives. 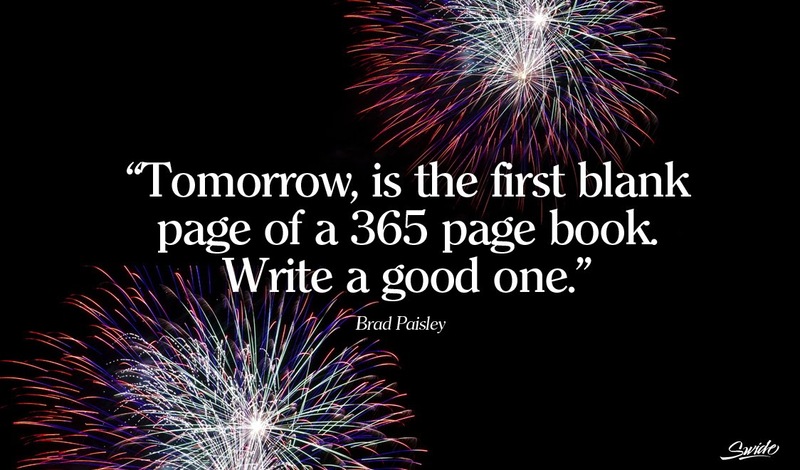 However, there is always a space for reflection, and prepare a new resolution in the new year. There are a few quotes and saying ever written and spoken leaders, authors, celebrities or famous people, as described below. Hope can inspire and motivate you to make a new resolution or plan a day full of happiness and success in the new year. Please share this simple article for anyone who is close to your heart, so that they also get inspiration for their happiness and new achievements for a year full of challenges, but always opens the gate to a new, more promising opportunities. “Hope Smiles from the threshold of the year to come, Whispering 'it will be happier'...” Alfred Tennyson. 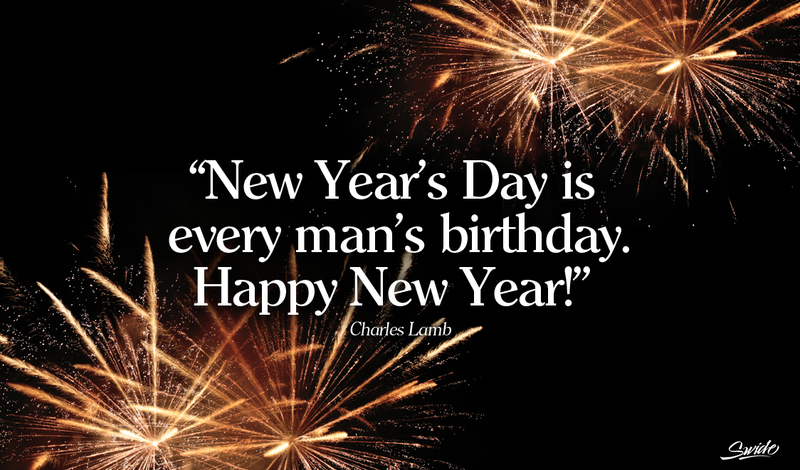 "Every time you tear a leaf off a calendar, you present a new place for new ideas and progress." - Charles Kettering. "As years passed away I have formed the habit of looking back upon that former self as upon another person, the remembrance of whose emotions has been a solace in adversity and added zest to the enjoyment of prosperity." - Simon Newcomb. Inspiration and dreams could move a person to achieve goals and targets. Does not matter where you are today, but where would you go, that's more important. Is this true? Human is a blend of soul, body and mind. Humans have a strange mixture because it can very good, cruel, mischievous, flirty, passionate, kind, and a mixture of good and bad. There is a gray area in the attitudes and actions. Humans can be very so stable, strong, fragile, indecisive, hesitant, energetic, fun, happy, sad, or confused. 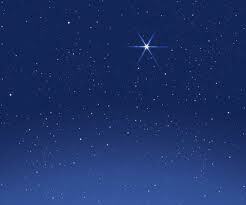 The creator has given us a good variety of tools that we can see,vague, and something that only we can feel. We've all been so fragile, passionate, motivated to do good things,work hard or do not even do anything with a variety of reasons that make no sense or if we make it as plausible. For this reason, we occasionally need to contemplate, may have to meditation, that we find consciousness to choose, do anything, say anything or act. We can get inspiration from someone or from the condition of the universe like the sun rising in the morning, sunset, beautiful mountain, an eagle flying in blue sky. We can also be affected by the impact of natural disasters in the human heart. Who am I? Are we behaving real or fake? Do not be afraid, do not worry, because life must go on. We must fill our lives with good things to yourself, others, family and nature around us with love. Are we ready to love and be loved? I wanted to share the beauty of words and the power of words that can give us inspiration and motivation. This has been my dream since a long time, that's why I created this website. Although I am not a motivator, but a lot of things I hear and I experienced, or a story I have ever read, then It's time I share it. If you have a collection of quotes, proverbs, about anything, or if you have experiences that touch hearts and inspire people around the world, please send to: bona789@gmail.com. I'll give it a good place on this website, so it can be felt by anyone, wherever they are on this planet. What a wonderful life when we can share with each other for a brighter future. There are many people who are skeptical, so they live is flat and often drift away. There is also the rather because they have a dream, even more than one. 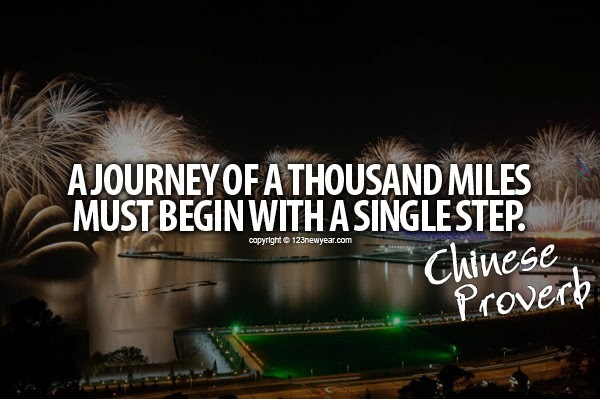 Of the many people who have had that dream, only a few are making a clear goal. If you are part of them, then in addition to a powerful dream, then you have to make goals as clearly as possible, and will be easier when you realize you can also visualize your dreams. The trick is very simple, and can be given an example which is also very simple. 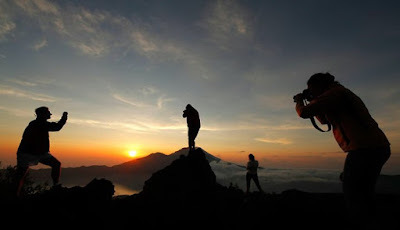 Suppose you have a dream to buy a digital SLR camera that you will use for a vacation to Bali, or because you want to be a professional photographer, then it means that you can do is pick up a brochure from the camera of your dreams. Attach photos of the flyers on the wall of your room, you can even download images from the camera and use as profile picture on your smartphone. 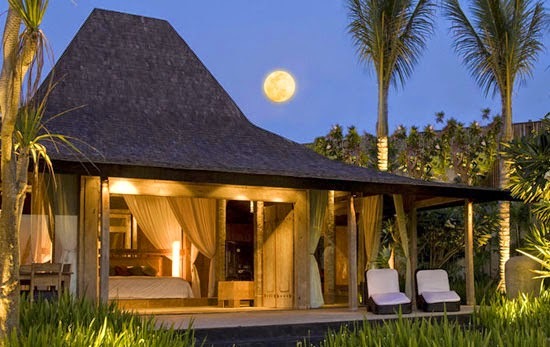 Similarly, if you want to have a dream house, such as a beautiful villa in Bali, so you can do the same thing. Several photos of the things you dream of, then you stick it in a dream book, it is a real example to create a visualization. Why visualization is very important to realize a dream or a noble aspiration. Humans are very influenced by what they hear and what they think, so that they can be, even affecting what they would say, and the actions they will do. At this moment, I wanted to share how to visualize the strength of which has been spoken and written by celebrities, famous people from various professions. Their saying has inspired many others, and quoted in a variety of events. Perhaps you will get inspiration and to motivate you to change, so that it can realize your dreams. Prior to that, perhaps you've heard this unknown quotes, "Wishes are for fantasies; fantasies are for dreaming; dreams are for living! Do you agree? “Part of my preparation is I go and ask the kit man what colour we're wearing - if it's red top, white shorts, white socks or black socks. 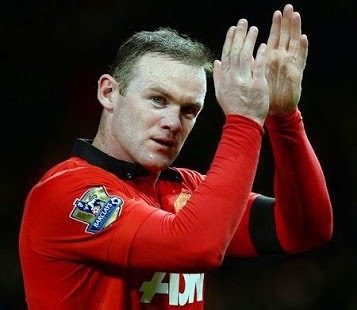 Then I lie in bed the night before the game and visualise myself scoring goals or doing well.” Wayne Rooney, the Captain of Manchester United, the famous soccer club in English Premier League. "Before every shot, I go to the movies" Jack Nicklaus – Golf Master. “Visualization and belief in a pattern of reality activates the creative power of realization.” – A. L. Linall, Jr.
Actually, there are so many beautiful words, and quotes remarkable and can be used as an inspiration. In essence, we can not do great things if only to say it just like that. You need to write it, even drawing in a dream book. If you put some photos of what you dream of, for example, you dream about a dream house, then you will always have a great driving force to make you move, work harder, but you always think about your next steps, and act intelligently. In July 2014, Indonesia was running a huge party of democracy, where the people of Indonesia elect a new president. Joko Widodo alias Jokowi the presidential candidate with his running mate, Jusuf Kalla dealing with Prabowo and Hatta Rajasa. 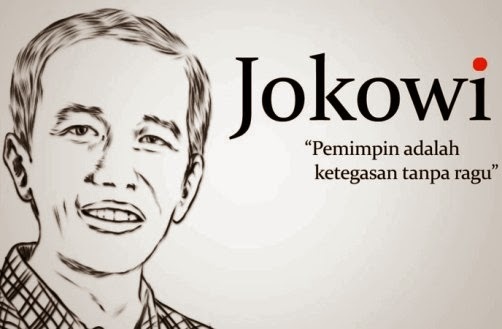 Who is Jokowi? Why is this skinny guy can captivate the Indonesian people, even a lot of praise from abroad? Is he going to be the new leader for Indonesia? Indonesia, as well as a new country, in the era of 45 to 60s, was led by a great leader, who has inspired people, even inspired the independence of countries in Asia and Africa in the colonial era. Sukarno proclaimed Indonesia's independence on August 17, 1945. 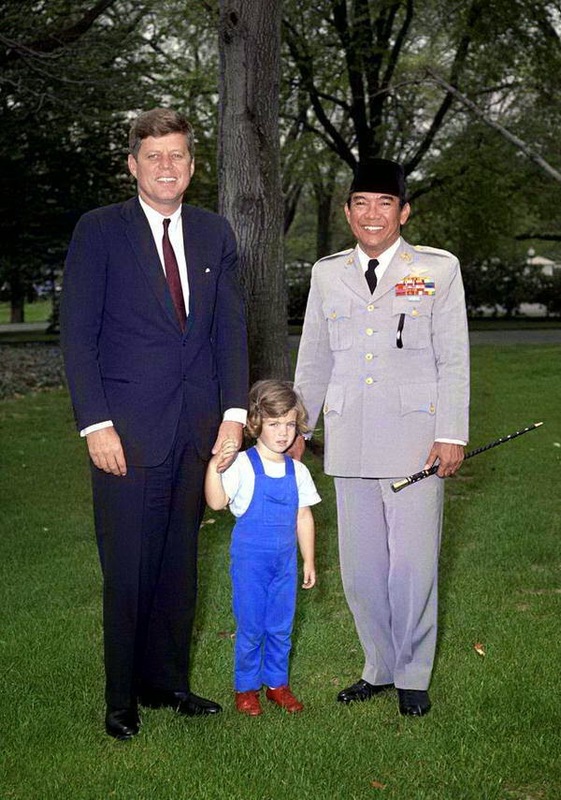 Sukarno is the founding father of Indonesia. Does Jokowi could become a new icon for Indonesia and inspire people in this equatorial country? Jokowi is a humble leader who was born of an ordinary family in Solo, a small town in Central Java, Indonesia. These young men when striving to become an entrepreneur in the field of furniture. He managed to achieve success in business, and managed to become an exporter of furniture to many countries. He continued his political career from the bottom, until eventually in his party colleagues who saw the potential in Jokowi, and eventually he was elected twice as mayor of Solo. His career continued as a governor in Jakarta, a metropolitan city, the capital of Indonesia. 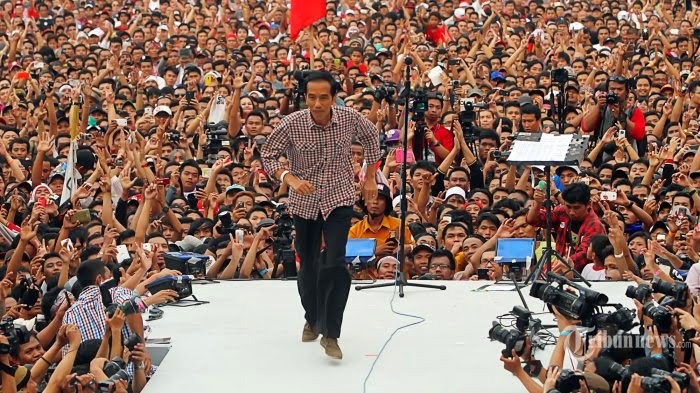 Both in Solo and Jakarta, Jokowi many changes physically and city paradigm shift in people led by this skinny guy. Compared to most of the mayors, regents, governors or other ministers, Jokowi has a distinctive and unique, which is rarely done by other government officials. Jokowi often "blusukan" or conduct visits and inspections to various locations to find out the actual situation that occurred in the city he runs. He does not just rely on the staff report and its officials. He really enjoyed meeting the people, ready to hear the complaints and the needs society. Nonetheless, Jokowi also do not like the disorder that occurred in the city, for example the omission of vendors who do business on the sidewalks, in the street, in a city park, illegal parking and other violations committed by the citizens. Because of these problems have long been left without a solution by its predecessor, the Jokowi initially difficult to perform policing and law enforcement. He had a mission to make the city so that they lead a more orderly, more beautiful and comfortable for its inhabitants, and can make happy the tourists who visit to Solo, or Jakarta. In contrast to the mayor or the governor general, who normally would take legal action the hard way - Jokowi many times a unique approach - the street vendors in Solo invited to lunch to his office. He gave an explanation, that the common areas such as a park or garden should be free from interference by interrupting the convenience of pedestrians, as well as the general public. Jokowi also provide solutions in the form of a place to do business in a new place. In fact, he ordered officials to promote the new location, and provide rent relief, so that small businesses could rise up and succeed. In the early days as governor of Jakarta in 2012, Jokowi also run his mission and vision are not much different when he became mayor in Solo. Jakarta is a big city, so did the population, much larger than the Solo, is certainly a problem in Jakarta is also very complex. However, as a leader who does not have a debt of gratitude to the political elite or business elite, Jokowi can do policing and law enforcement without doubt. As is the case in Solo, then in Jakarta he also acted decisively to corrupt bureaucrats, also dare stop the program that will cost the government money. or when he relocate the street vendors, or squatters on the edge of the railroad tracks and river banks. For these severe problems, Jokowi remains a persuasive approach, dialogue and appropriate solutions. Though not even two years rule as governor of Jakarta is rich with social problems, Jokowi Megawati Sukarno Putri nominated by - former President and Chairman of Indonesia and the Indonesian Democratic Party of Struggle (PDI-P) - the Indonesian presidential candidate. Competitors is Prabowo coalition with many other parties. Balloting will be conducted on July 9, 2014. Prabowo was a former military officials, but stopped as a Lieutenant General with a dismissal in 1998 for violating the military discipline, and allegedly kidnapped the 13 activists. 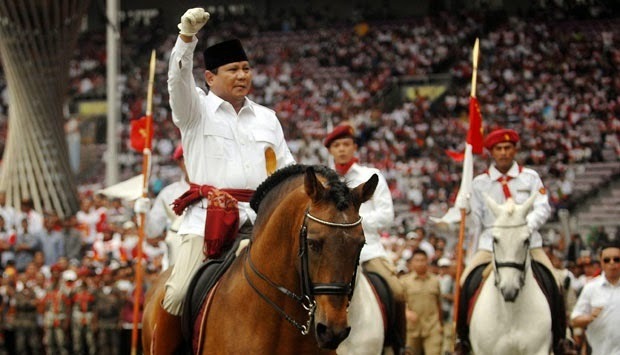 Prabowo imaged as a firm leader, and has more than 10 years to prepare himself to become president. In a unique social and political situation in Indonesia, Jokowi is not easy to challenge Prabowo, who supported a variety of large party in a grand coalition, compared Jokowi which only supported a few political parties. However, Jokowi has proven that Jokowi supported by the majority of Indonesian people are dreaming of a big change. 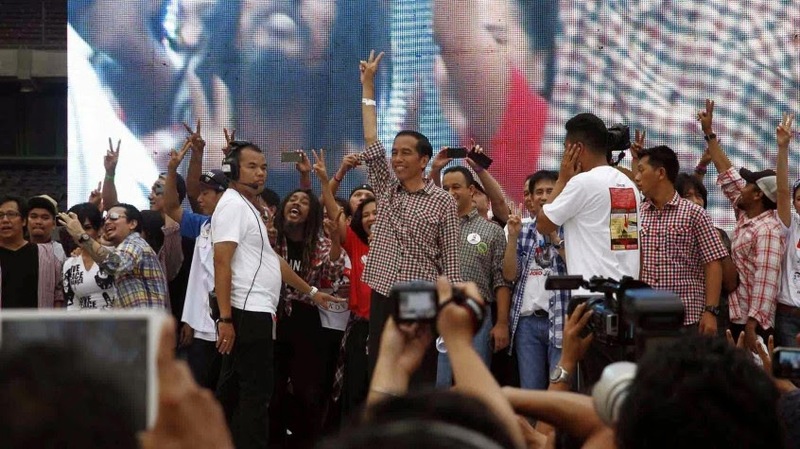 There are thousands of volunteers who freely devote their time and money to support Jokowi. Jokowi had a very inspiring vision, namely Revolusi Mental or "Mental Revolution". Why mental revolution? Indonesia wants to be changed by the people of Indonesia that Jokowi mentally more positive, more optimistic, more confident, more disciplined, ready to work hard, be creative, so that the people of Indonesia can compete with other nations, at least in the ASEAN region, especially Indonesia will enter the era of community ASEAN and AFTA. Program of creative industries and creative economy into one of the programs Jokowi campaign, captured the hearts of Indonesian youth and many Indonesian artist. 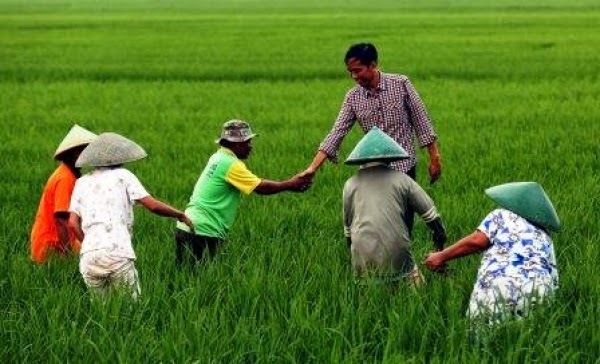 Community of farmers, fishermen, small and medium-sized businesses, as well as teachers and ordinary people in general agree with the program Jokowi and his running mate, Jusuf Kalla, because it is considered more reasonable, and can be implemented than the vision and programs Prabowo and Hatta Rajasa. All Indonesian people, maybe even a lot of people in other countries, who also want to see a new leader for a better Indonesia, may be looking forward to win her heart pounding a new Indonesian President for the new changes, so that the voting on July 9, 2014 is an momentum and a new history for Indonesia. Jokowi could be an inspiring solution to the changes. Inspiration and Motivation © 2015. All Rights Reserved.